As businesses embark on their strategic sales planning for 2009, the common remark we hear is that they are planning for sales to stay flat, so the focus of their planning will be to cut costs to maintain or improve their 2008 profit performance. But there is another option that might be worth taking a look at. 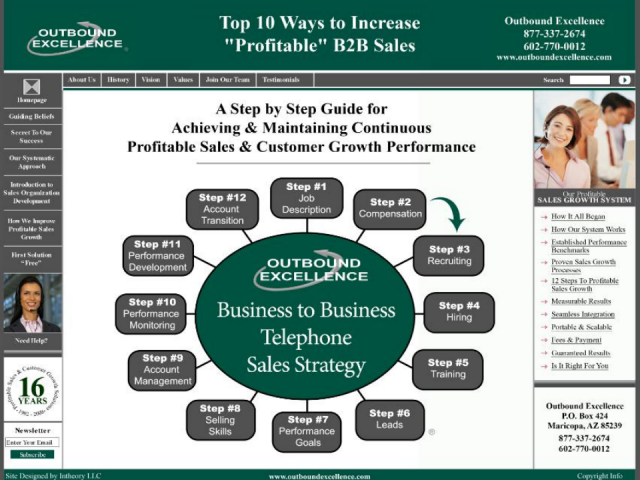 For companies that have an Outbound B2B Telephone Sales Model, there are some little known "Best Practices" that have proven to improve Profitable Sales Growth Performance regardless of the economy. In this presentation, we'll show you 10 Ways to Improve Profitable Sales Growth Performance that you probably aren't aware of. Then, in our next BrightTalk webcast, we'll share with you a patented system we've developed that will cut your sales costs by an average of 10%. It might sound a bit crazy, but it only takes a few minutes to take a look. Please, be our guest, and join us for this webcast presentation.